Faq Christchurch households 15 09 2015 ElectricKiwi.co.nz - Smaller. Smarter. We've recently started advertising in Christchurch to get the word out about Electric Kiwi and the free Hour of Power! Around 90% of homes in the city on the Orion network have a smart meter, which means lots of you can connect with us and get a free 60mins of off-peak electricity every day. We started connecting to homes in Christchurch and all around the country in May (to see if we're in your area click here) By making the most of their Hour of Power, our customers around the country are saving up to 15% on their bills. Below is our advertorial in the Christchurch Mail that explains how. Christchurch households are switching on to new technology designed to reduce power bills. Using the half-hourly digital readings from smart meters, online power company electrickiwi.co.nz has developed a product called the Hour of Power - a free hour of off-peak electricity every day for every customer. “The Hour of Power is a really simple way to cut your power bill by changing when you use power,” said electrickiwi.co.nz managing director Julian Kardos. Kardos said over a quarter of Electric Kiwi’s customers were from Christchurch, and as a group, they had higher than average Hour of Power savings. Latest figures show 62 percent of all households now have a smart meter, which record a household’s electricity consumption every half hour. It is expected the majority of residential properties in New Zealand will have a smart meter installed in the next few years. 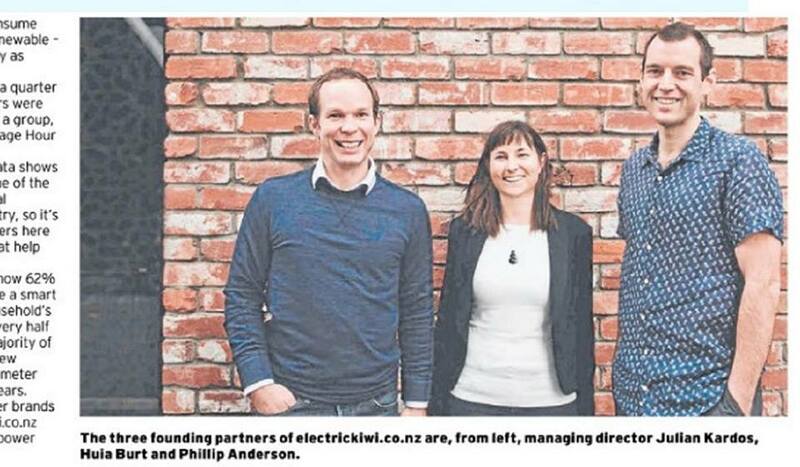 One of the newest power brands in the country, electrickiwi.co.nz was “not your traditional power company,” said Kardos. electrickiwi.co.nz launched to the public in May.